Until last weekend’s Belgian Grand Prix, Jenson Button had never started on pole for McLaren. He made up for that by lapping Spa-Francorchamps three tenths faster than anyone else in qualifying on Saturday, setting up the ideal start to Sunday’s race. In the race, Button was untouchable, disappearing into a comfortable lead in the first few laps as all hell broke loose behind him in a massive first corner crash, and controlling his pace thereafter. He led every lap of the race, the first time that has been done this season, and took a thoroughly-deserved second win of 2012 to put himself back in contention for the title. Button’s performance was masterful, reminiscent of the early part of 2009 where he was easily faster than the rest of the field. The difference is that this year’s McLaren is not nearly as dominant as the Brawn car was in 2009. Button has developed massively as a driver since winning the World Championship, and yesterday’s win was a demonstration that he is right up there with the best in Formula One at the moment. If Button was impressive, Romain Grosjean was precisely the opposite. After appearing to be a little hot-headed at the start of the season, the Frenchman seemed to have calmed down a bit recently and was beginning to get on with the job of finishing races. 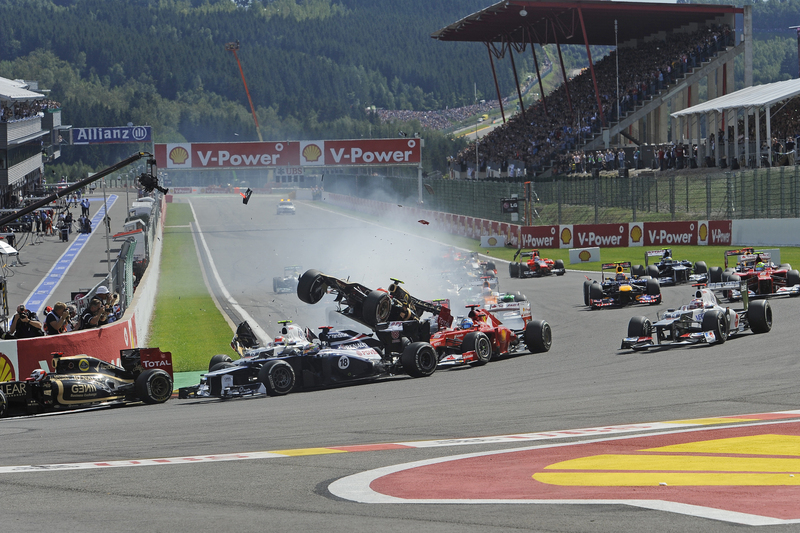 At Spa, however, his rash streak made an unwelcome comeback as he pushed Lewis Hamilton onto the grass on the way to the first corner. That started a chain-reaction that resulted in Grosjean spinning through the air over the back of Sergio Perez’s Sauber and perilously close to Fernando Alonso’s head. Miraculously, no-one was injured, but it was a stark reminder of the dangers involved in open-cockpit racing. The first corner accident took Grosjean, Hamilton, Alonso and Perez out of the race, and shook up the order behind Button quite significantly. Raikkonen had escaped the drama and was running second. Behind him, the Force India pair of Hulkenberg and Di Resta found themselves third and fourth, followed by the Mercedes of Michael Schumacher in a surprising fifth from 13th on the grid. By the end of the race, the order had settled a bit, and Button led home Sebastian Vettel and Kimi Raikkonen. Nico Hulkenberg finished an impressive fourth, with team-mate Paul Di Resta tenth to complete a double points finish for Force India. Felipe Massa took a credible fifth place, followed by Mark Webber who was lacking straight-line speed and struggling to overtake as a result. Michael Schumacher had looked set for a top-four finish until high tyre degradation forced him to pit and he subsequently lost sixth gear. He nursed the car home in seventh, ahead of the Toro Rosso pair of Vergne and Ricciardo, who game their team a much needed double helping of points. The first corner incident is likely to result in some discussion about head protection in Formula One cars, and talk of closed cockpits is already beginning to resurface. Perhaps of more concern is the lack of peripheral vision afforded to the drivers by the current high cockpit sides. Although the design greatly assists in protecting the driver from harm, it also greats a very large blind spot alongside the car. Solving that problem while maintaining safety is a great challenge for the rule-makers of Formula One. The championship has opened up quite a bit after Spa, as Button won with Alonso and Hamilton not scoring. Vettel’s second place finish pushes him up to second in the table, within a race victory of Alonso. Kimi Raikkonen’s consistency has paid off, as he is now just 33 points off the championship lead. With eight races left in the season and the cars as closely matched as they are, the title fight is far from over.